View the the official programme of events taking place at the Villa Fiorentino throughout the year. 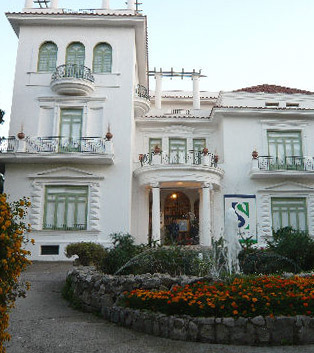 This includes an exhibition of more than 90 works of art by Henri Matisse. Here is a more detailed review courtesy of Villa Fiorentino website, translated by Google. The first exhibition will be the third edition of “SORRENTO IN ARTE” by the Associazione Pittori Sorrentini, presided over by Raffaele Iaccarino. The collective will remain open to the public from 2 to 27 February, free admission. On the 2nd, 3rd and 4th March there will be the XVI edition of the EXHIBITION OF CAMELIA, curated as always by the Garden Club Penisola Sorrentina. Camellias from the gardens of the Sorrento Peninsula will be exhibited as potted camellias. The last day will be dedicated to school children. Free admission. From 9 March to 6 April it is the turn of the anthological painting by Nico Taminto entitled “IN THE SIGN OF MAN – A RULE OF ART”. The works realized in 50 years of activity will be exhibited. Free admission. From April 10 to May 1 on display the excellence of the artisan Sorrentine Peninsula in the event “MANU FACTUM”. The members of PenisulArt will each bring their own piece to represent all the sections: crib art, violin making, jewelery, fashion, ceramics, ceramics, inlay, cabinet making, metals, poor art, artistic glass, photographers, sewing, painting, modeling and sandals. Free admission. From May 3 to May 6 a three days dedicated to “THE ART OF TEXTILE AND EMBROIDERY”, review curated by the Cooperative “La Sirena arl” chaired by Mrs. Carmela Scala, in collaboration with the Association “Il Punto Sorrento”. Free admission. 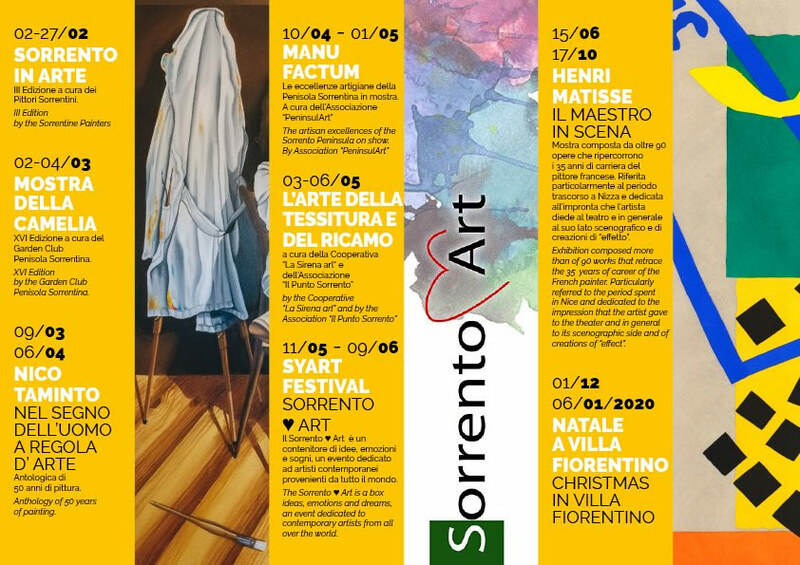 From 11 May to 9 June the third edition of SyART FESTIVAL – SORRENTO LOVES ART will take place, an event dedicated to artists from all over the world that has an annual cadence and that has seen in the last edition 32 artists representing 5 nations. The flagship event of the cultural vintage of the Sorrento Foundation is represented by the exhibition “HENRI MATISSE – IL MAESTRO IN SCENA”, which will be exhibited in the rooms of the villa, over 90 works that retrace the 35 years of career of the French painter With particular attention to the imprint that the artist gave to the theater and to the creations to effect From 15 June to 17 October, admission fee. And as usual the last part of the year will be dedicated to the most magical party of the year with “CHRISTMAS IN VILLA FIORENTINO”, with rich news. From December 1st to January 6th 2020. 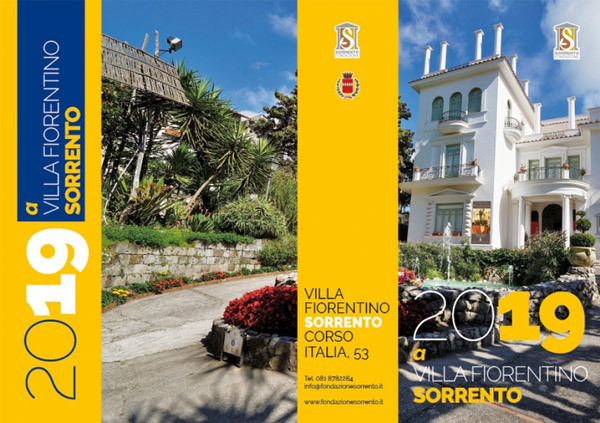 A rich year to live under the banner of culture and tradition for guests who will visit Sorrento, but also opportunities for the citizens themselves who want to enjoy Villa Fiorentino as a place of art and leisure for leisure.